When you and your family need a targeted financial solution, Sun Life provides a portfolio of smart life insurance plans that let you customize the benefits you need to the plan you want. With a range of available life insurance options including term life, whole life, and universal life products; Sun Life is able to create a plan that works for you. SunSpectrum Basic 25 years or to age 65 Ages 18 to 50 Guaranteed rates for the period chosen. Available up to $500,000 in coverage. SunSpectrum Term 1, 5, 10, 15, and 20 year terms Ages 0 to 79 Renewable and Convertible without a medical exam. Rates are guaranteed for the length chosen. SunTerm 5, 10, 20 year terms Ages 18 to 70 Intended for higher coverage needs. Rates are guaranteed for length chosen, and is renewable and convertible without a medical exam. FutureInsure Term Life Express 1 year renewable Up to Age 70 Up to $500,000 available with only 7 health questions and no exam. Yearly adjusted premiums. Intended for “hard-to-insure” individuals. SunSpectrum Permanent Life For Life Up to Age 75 Provides level protection and a guaranteed premium for life. A cash value begins on this plan in year 10. May be included with term protection. 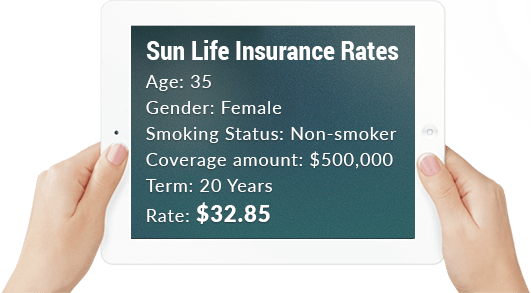 Sun Limited Pay Life For Life, with limited-pay options Up to Age 75 Provides level protection and guaranteed premiums for the period you have chosen. A choice of 23 investment accounts can guarantee growth on your cash value. Sun Par Protector For life, with 20 year pay, to age 65, or to age 100 Ages 0 to 80 Guaranteed minimum premium for period chosen. This plan offers steady long-term growth for estate planning. Sun Par Accumulator For Life, with 20 year pay Ages 18 to 80 Provides higher cash values in the early years, ideal for individuals looking to maximize their wealth. You have the option to buy paid-up insurance. SunSpectrum Universal Life For Life Ages 0 to 80 Ideal for those looking to manage their wealth within a larger financial plan. 18 investment accounts available with daily interest. SunUniversal Life For Life Ages 18 to 80 Ideal for wealth management. 35 investment accounts allow you to overpay and use your insurance as tax-sheltered savings. SunSpectrum Basic Critical Illness 25 years or to age 65 Ages 18 to 50 Up to $500,000 in coverage for 4 basic conditions. May be owned as a single or joint policy. Sun Critical Illness Insurance 10 years, to age 75, or to age 100 Ages 0 to 65 Covers 25 critical conditions, 4 partial benefit conditions, and 5 juvenile conditions. Includes Best Doctors medical service at no cost. We are pleased to offer all life insurance products provided by Sun Life. For a quote on all available life insurance plans, please use our no-obligation quote provided on the right to explore your options and find the right fit for your needs.